A home inspection is a non-invasive, visual examination of the accessible areas of a residential property, performed for a fee, which is designed to identify defects within specific systems and components that are both observed and deemed material by the inspector. The scope of work may be modified by the Client and Inspector prior to the inspection process. Red Cliff Inspections follows the InterNACHI Standard of Practice. 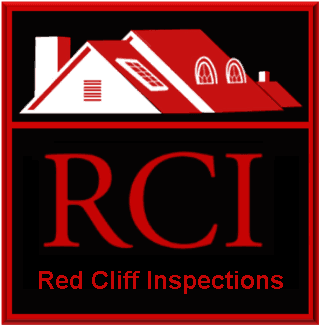 What geographical areas does Red Cliff Inspections (RCI) serve? Red Cliff Inspections is based in St. George, Washington County, Utah. We routinely serve clients in and around Washington, Iron, and Kane counties and the entire state of Utah. An abbreviated price list is available HERE. Additional info on pricing is available upon request. Contact us: call us at 435.275.9204 , or email redcliffinspections@gmail.com . What services does RCI provide? Red Cliff Inspections provides a variety of services which focus on determining the condition of Homes and Businesses including inspections and testing. Click here for a more complete listing of the services we provide. How soon can RCI schedule and complete an inspection for me? Our ability to quickly schedule your inspection depends on how busy we are serving our clients' needs. Generally, residential inspections can be completed within a few business days of a request for service. In many cases we can do an inspection and submit a report with 24 hours. How long does it take RCI to do the inspection? The amount of time needed to do an inspection is dependent on the several factors including the size and complexity of the property/structure. Most general residential inspections will take 2 to 3 hours to complete. How long will it take to receive a report from RCI following the inspection? An inspection report (in electronic form) can be forwarded to the client within 24 hours (and often the same day) following completion of the inspection. May I be present during the inspection? Yes, we encourage the client to be present during the entire time (or even part of the time) a residential inspection is being done - if they are available. However, the clients presence is not required. What does an inspection by RCI include? What does the inspector look at? What is not included in an inspection? Why should an inspection be done? Is an inspection required when I buy a home? When and How do I pay for services from Red Cliff Inspections? Payment for your inspection will occur prior to the inspection. RCI accepts Checks, Cash or Major Credit Cards. If there are no 'problems' found during the inspection does that guarantee that nothing will go wrong after I purchase the home? An inspection is a reflection of the conditions seen by the inspector at the time of the inspection and cannot guarantee conditions once the inspection is completed. However, we do provide a 90 home warranty at no cost for all of our residential inspections. This warranty covers all mechanical and structural components of the home identified as working at the time of the inspection. How long should the appliances, products, materials, and systems in my home last? Click here to check out InterNACHI Standard Estimated Life Expectancy Chart for Homes.